SPUF’s resident maidsassin Corvette is throwing a huge 10000-post giveaway! Some amazing contributions have rolled through, as SPUFers prove just what they’re willing to do to get free stuff. 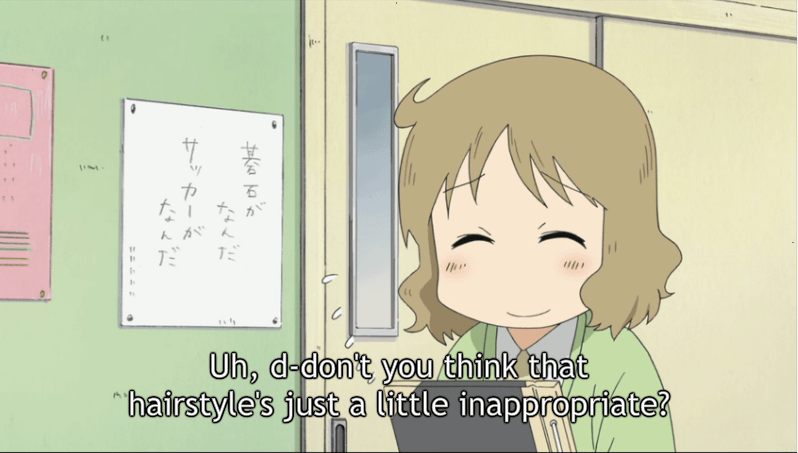 Well, it turns out I’m willing to watch 3 episodes of Nichijou, which Wikipedia describes as a “Comedy Slice of Life Manga”, but my friends were quick to correct me that manga is the comics and anime is the show. The fact that I didn’t know that should be an indication as to just how green I am in this field. But that Genuine Pip-Boy might as well be a Klondike Bar wrapped in a tuition scholarship for Hostess Fruit Pie University, so let’s get going. I understand about half the words in this blurb, but the link to entire legally-watchable episodes was what really sold it. 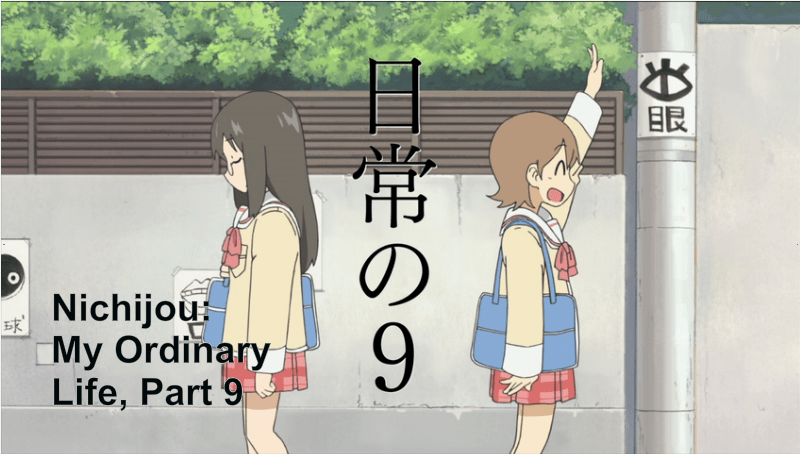 Episode 1 begins with a blue-haired high school student trying to motivate a brown-haired student who doesn’t feel like participating in school or even waking up. I can instantly sympathize with her. 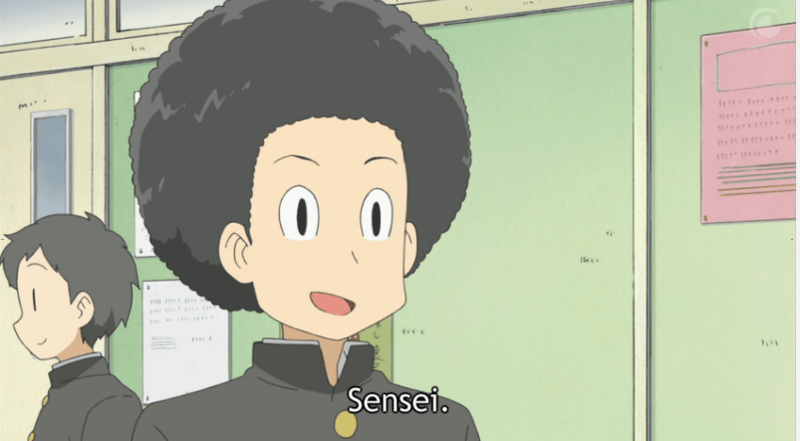 But not as much as I can sympathize with that hair. Please be a future main character, walking-past extra. 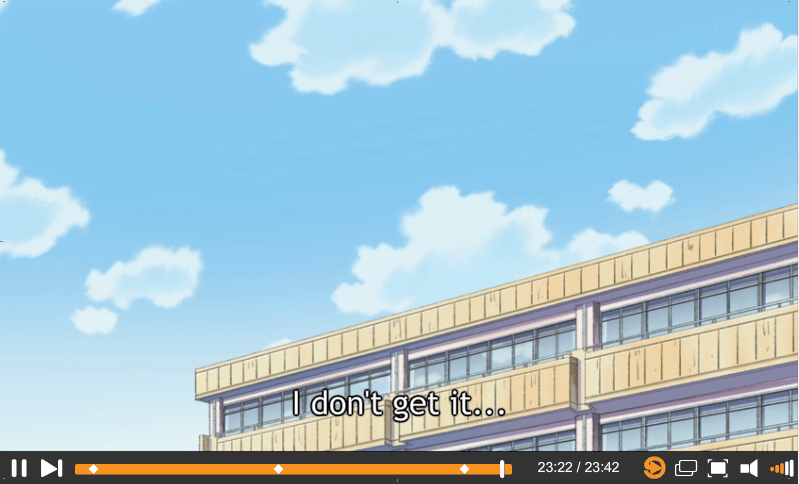 The opening scenes of this episode are mainly devoted to establishing the main characters’ personalities, each of whom I shall be referring to by their hair color because I can’t even remember the names of US Presidents, much less characters whose names are revealed only through English subtitles. Blue is headstrong and outgoing, Brown is introverted and lazy, Hazel is childlike, and Black has a giant wind-up key in her back. The opening credits seem to imply a much larger main cast than just these four. I’m looking forward to Red joining the series, as there were no less than three images of her carrying heavy artillery in the main credits. What I thought was a sight gag (Black crashed into a boy and a nuclear explosion happened) turned out to be a more important part of the plot when the entire city was ravished by flying debris. Striving to continue their schoolwork despite the fallout, the students all go to school where their teacher is inexplicably the same age as they are. Black, who missed school due to being at the epicenter of a nuclear blast, wakes up on a roof missing her arm, which is less gruesome than it could have been because she turns out to be a robot. I really should have guessed with the giant wind-up key. Trouble brews when the resident rich kid strong-arms the inexplicably young teacher into allowing goats at the school, whereupon he is shot by Red (she doesn’t disappoint!) 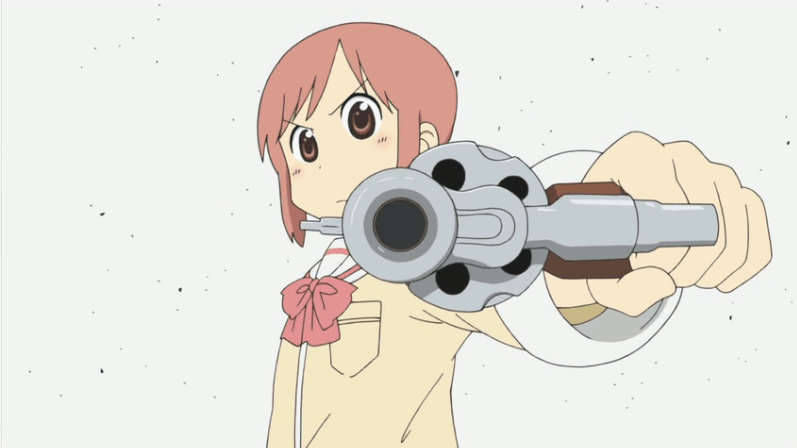 with a high-caliber revolver, in her debut appearance. Don’t worry, he gets better in the next scene. The “Sketch Comedy” aspects are completely non-sequitur segments inserted at random intervals. Which, I guess is the basic definition of sketch comedy. I’m quickly learning that this genre is not very plot-dependent like I’m used to. The episodes are driven almost entirely by character personality, rather like Seinfeld. And the character archetypes aren’t exactly ground-breaking, I forgot to mention the straight black-haired glasses girl who is always reading and has a (three guesses) bookish, quiet personality. However, the first episode did accomplish its goal of introducing the main characters. When next I see them again I’ll expect what behavior I see from them, which is probably the best thing a pilot can do. 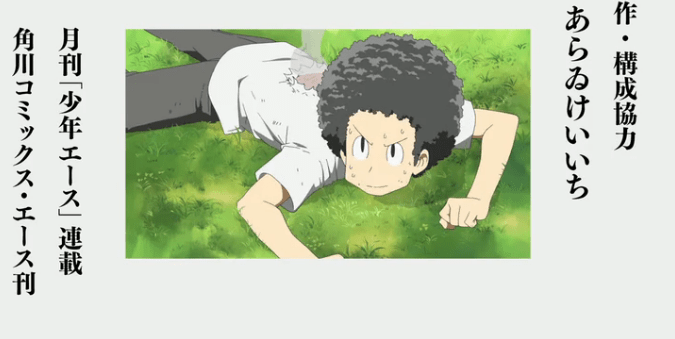 Also, the main credits showed afro kid again but he never actually said anything. I expect this remedied in the next episode, or I will be very cross. We rejoin our heroines playing rock-paper-scissors outside the school before bookish girl chants a resurrection spell. Meanwhile Blue is late for school because her alarm stopped and her mother is playing sepak takraw with the Neighborhood Association. 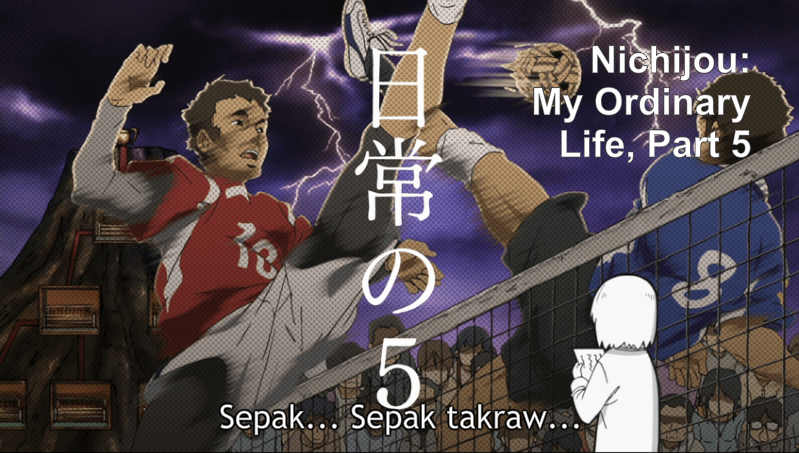 I don’t know what sepak takraw is, but the following screenshot makes it look really badass. Wait, part five? This is the second episode! What did I miss? Blue is thereafter stalked by an actually-rather-unsettling student in a schoolgirl’s outfit and plush bear head. Robo-girl eats a cinnamon bun that came out of her own head, and Brown jumps rope with two boys that have Mochi for heads…I think. 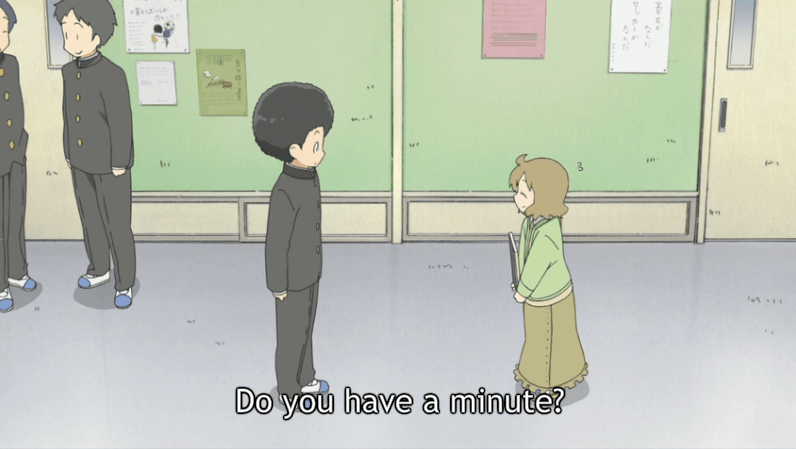 As already established, this show relies incredibly heavily on “random” humor, which is nice I suppose, but the characters are forced to carry the series entirely on their personality and their reaction to sight gags, and at the moment the characters haven’t proven to carry much personality at all. Luckily things pick up in the second half, where Blue realizes she doodled an embarrassing picture in her homework and loaned it to her friend without erasing it. After some wacky hijinks ensue, she retrieves the notebook but turns it in without remembering to erase the drawing. It’s not much, but I did appreciate the brief plot. 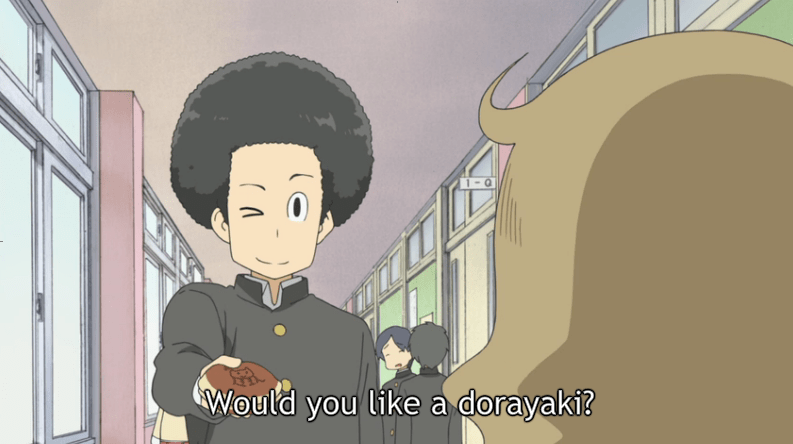 I was really sad that this girl didn’t appear until the end, and again afro kid hardly appeared at all. You lied to me again, main credits! My favorite part of the episode was Red trying to brainstorm events for the summer festival with the rich goat kid, and repeatedly shooting him with high-caliber artillery when he messes around instead of working. Anyone who has ever had to undergo a group project in high school has experienced this, but only she can channel her frustrations the way we’d all like to. A cat that looks exactly like the one from Kiki’s Delivery Service falls out of a window trying to catch some birds, just in time for the title card. On that note, sometimes I wonder which character is the titular one. 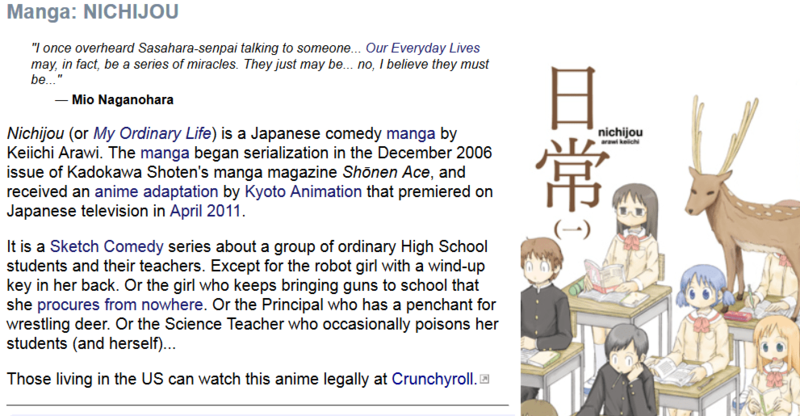 Nichijou translates to My Ordinary Life according to Wikipedia, implying that somebody is the main character. I guess the blue-haired one has the most claim to that fame; we’ve seen her house and she’s appeared in the opening scene of every episode. This time she’s forgetting her math homework and running home to get it. Stop appearing in the opening credits if you aren’t going to do anything! …but in general none of these characters except rich goat kid have even had an on-screen line. 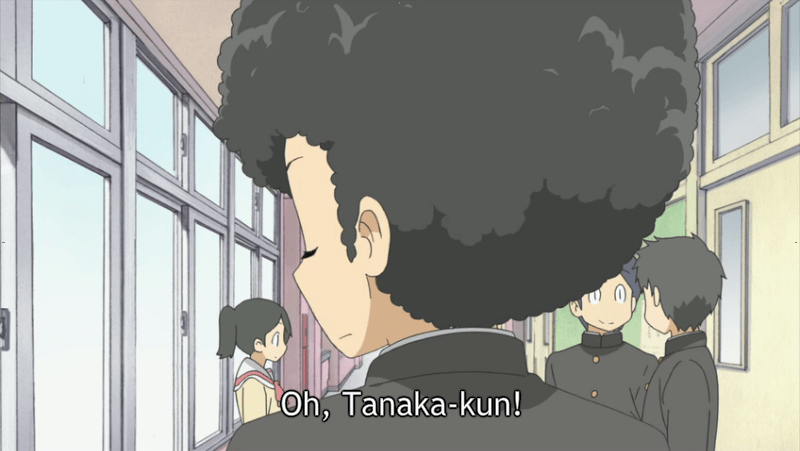 I supposed given the genre I shouldn’t be surprised, but their distinguishing hairstyles tricked me into thinking they’d have some sort of relevance to the show. But they don’t, so moving on, Brown can’t get Bookish to speak to her, and she thinks it’s because of any number of comical slights Brown has accidentally beset upon her, from eating her lunch to stealing her possessions. But it turns out she’s just shy and bookish and honestly hasn’t noticed anything. My god, is it finally happening? He had a line! It was all worth it! And it was all a throwaway gag but still, he talked his way out of detention, what a boss! 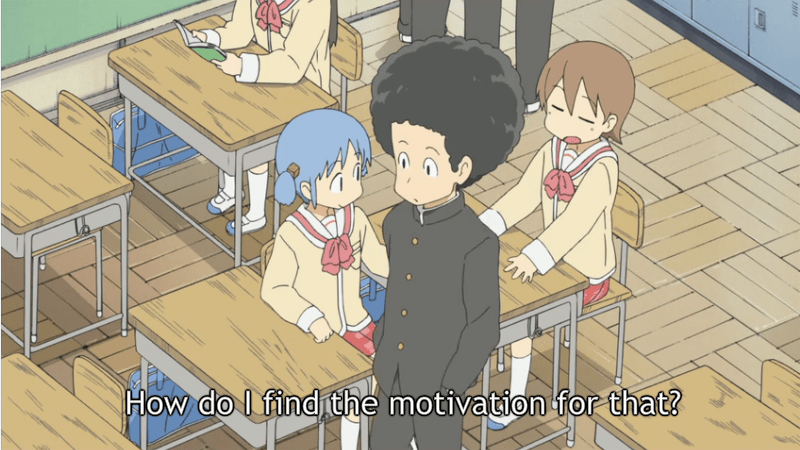 Despite afro’s show-stealing scene, the focal character appears to be Brown this episode, as she suffers through math class copying other student’s homework and trying not to get called on by the teacher. 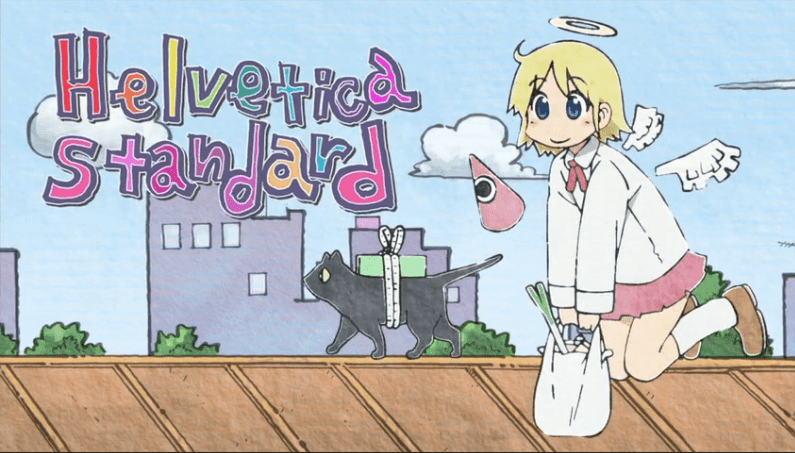 There’s an unrelated plot tying back into the robot girl, as she finds the cat from the beginning of the episode and wishes she could keep it, but concludes that she could never be a good enough caretaker because she’s a robot. I really want to like her character because she’s got an interesting gimmick, but every scene with her appears to just play up her self-imposed drama of being a robot. There is so much more this show could do with her than just repeatedly play her as a one-sided Pinocchio. The cat, after being fondly patted by Robo-girl and Hazel for far longer than he’d like, reveals he can talk and tells them off for not respecting their elders, as he’s “twenty in cat years”. Then they threaten to get rid of him and he shapes up his act. Man, I wish I could do that to real cats. To wrap the episode up, Brown challenges bookish girl to an arm-wrestling match and loses handily 24 times. Bookish apparently has more strength than her character archetype would imply. She makes Brown pay in full for every bet made on those arm-wrestling matches, and in true Seinfeld-style Brown doesn’t learn a thing at the end of the episode. As all good comedy protagonists shouldn’t. I’m glad I watched all three episodes, because it was only really in the third that the characters started reaching their stride. As mentioned, Bookish acted outside her normal personality tropes, as did several other characters, which is the hallmark to becoming a rounded character whom the audience wants to come back and see every day. Before that, the best thing this show had going for it was the healthy amounts of comeuppance granted onto annoying characters by likeable ones, which is a wish fulfillment I can totally get behind. Conclusion: In true aabicus fashion, I completely forgot about deadlines and didn’t finish this until after submissions had ended. Congrats to That One Spy for winning the Pip-Boy, and to all the winners of the 10,000 Post Giveaway! You can check out many of the winners in this thread. Thanks Corv, on behalf of everyone on SPUF!